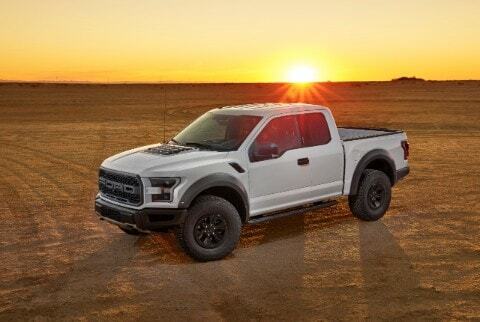 The all-new Ford F-150 Raptor is a new take on this American classic. The new model shows just what you can do with the F-150, pushing this pickup to the limit. Great new features include a rigid off-road suspension, a rugged exterior, and added power. You won’t be able to take your eyes off this reinvented F-150. According to Ford, the new Ford F-150 Raptor comes with a 500-pound weight reduction to improve handling and performance, not to mention fuel economy. A 3.5-liter high-output engine generates up to 450 horsepower and 510 lb-ft of torque, which is paired with a 10-speed transmission for better acceleration both on and off the track. Naturally, this model has the same high-strength aluminum alloy body that it has had for the past few years, as well as some new additions. The off-road suspension can handle virtually any terrain, while skid plates and prominent badging add appeal. A dual-mode transfer case is perfect for off-roading, while a dual exhaust and oil-cooled pistons increase power. Discover your love of driving in the new Ford F-150 Raptor. The Future of Tough…2015 Ford F-150! With multiple, integrated welding points on its high-strength steel skeletal structure and the addition of Military-Grade Aluminum Alloy as the body and bed, it is only right we compare this revolutionary transformation to the one of Wolverine from the X-Men. When Wolverine was newly equipped with his adamantium skeleton he was stronger and virtually indestructible, a similar situation to the new 2015 Ford F-150. These new structural additions not only made the 2015 Ford F-150 stronger but approximately 700lbs lighter for an improved power-to-weight ratio resulting in faster acceleration, enhanced handling and braking. It can now tow up to 12,300lbs, which is, give or take, the weight of two and a half F-150s or about 5 fully grown bulls… and ­­ tows it more efficiently than ever before! Visit Hassett Ford, Lincoln, Subaru, Truck and Pre-Owned for your new vehicle! We are in Wantagh, NY in Nassau County near Suffolk County, NY. If you are looking to buy, lease, or finance your new Ford, Lincoln or Subaru at the right price, call 516-785-7800 today or visit www.HassettAutomotive.com. We serve Long Island, NY, Wantagh, NY and the surrounding areas. Come to 3530 Sunrise Highway, Wantagh, NY 11793. The 2015 Ford F-150 is known for being the best F-150 to ever roll off the assembly line. With an aluminum body and a brand-new design, Ford’s popular pickup truck is racking up awards both left and right, while establishing itself as the best pickup in its segment. Now, Ford has confirmed the F-150 is the best yet again by releasing 2015 F-150 fuel economy ratings. With a weight reduction of 700 lbs from previous models, the new F-150 has an EPA estimated ratings of 22 mpg combined when equipped with a 2.7-liter EcoBoost engine. This is a significant increase of 5% to 29% in fuel economy compared to current F-150 models. The F-150 combines high-strength steel and high-strength, military-grade, aluminum alloys to reduce weight, while increasing capability. While it has increased its fuel efficiency ratings, the F-150 has also increased its towing capability by 1,100 lbs and hauling capabilities by 530 lbs. For more information on the new Ford F-150, contact Hassett Automotive. It’s always a good sign when a company is adding jobs. It almost always means it is growing and having a lot of success. In the past couple of years, Ford has been adding new jobs left and right. The most recent Ford job expansion comes at the Dearborn Truck facility. Ford will add 850 new jobs at the Rouge Center to expand production of the all-new 2015 Ford F-150. The jobs will be divided among the three facilities at the center. 500 will go to the Dearborn Truck facility, 300 for the Dearborn Stamping plant, and more than 50 at Dearborn Diversified. Just this year alone, Ford has added more than 3,000 hourly jobs to Ford facilities across the country. And, since 2011, Ford has created more than 14,000 jobs, which has exceeded its initial goal of creating 12,000 hourly jobs in the United States by 2015. Here at Hassett Automotive, we love hearing about Ford’s job expansions and can’t wait to get the 2015 Ford F-150 built by hard-working Ford employees. It’s hard not to get excited about the new 2015 Ford F-150 – we certainly are here at Hassett of Wantagh! Just when we thought it couldn’t get any better, Ford announced they will be offering added protection for the new model against sunlight. Sunlight doesn’t exactly sound that menacing, but everyone has seen vehicles that are fading inside and out, and we’ve certainly all experienced glare while driving. Well, the new features on the 2015 model will help prevent all of that. According to the Ford, researchers at the Ford Central Lab have developed new materials and subtle design changes to help resist the damaging effects of sunlight. After extensive testing, Ford has found a solution. The new 2015 Ford F-150 is safer and designed to last longer. What’s not to like? For more information about new models, stop on by at Hassett of Wantagh. Back in 2011, Ford sent out six prototype F-150 trucks to three of its best industrial customers. Ford gave the companies these trucks for free and told them to put these trucks to work. What these customers didn’t know is that the beds were made of aluminum. Over the course of two and half years, Ford checked in every three months to see how the trucks were holding up and to get any customer feedback. The results were very good. The beds didn’t crack and could take a pounding and keep working. However, the customers did notice a couple oddities: magnets wouldn’t stick to the bed and scratches didn’t rust. Based on the feedback, Ford made a few changes, it made the aluminum floor thicker, altered the aluminum alloy to make it stronger, and modified the tailgate design. The testers finally learned the secret along with the rest of the world at the 2015 F-150’s reveal this past January. Want to put the all-new aluminum-bodied 2015 Ford F-150 to the test yourself? It will be rolling into Hassett Automotive later this year.